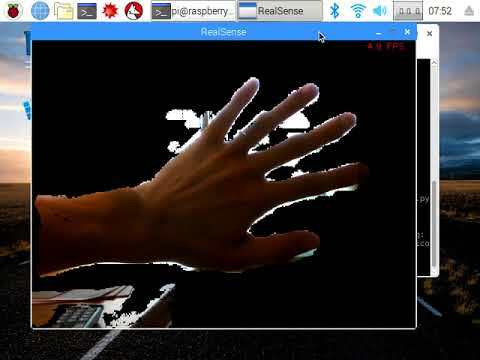 It may already be released by someone, but I made a cooperative sample of RealSense D435 + Neural Compute Stick + MobileNet-SSD + RaspberryPi3. 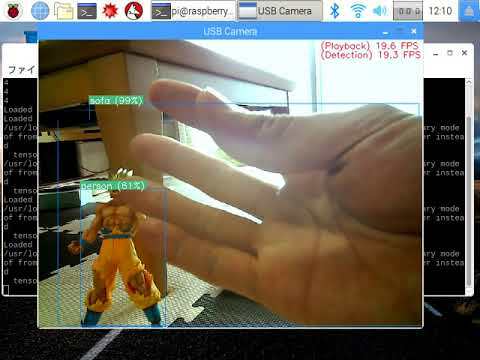 Distance can also be measured while detecting objects. I'm glad if you can use it as a reference. This time, it is single stick + single thread. By the way, sample of multistick + multithread is here. PINTO why will it not work with 2.0 +? Is it because of the initialization ? How many fps were able to maintain. This sample uses programs created for the generation of NCSDK Ver1. It seems that the call part of the API has been updated in Ver2. I just did not test it with Ver.2. I will make it correspond to Ver.2 in the near future. By the way, I have not measured FPS for the following programs yet. I will try it today. Please wait for a while. Movie playback and detection are performed asynchronously. Detection is probably about 8FPS for single threads and about 15FPS for 3 threads. FPS changes according to the input resolution of the camera. In order to prioritize speed, the input image is now dropped to 320x240, so it is a coarse image. 6.5 at 320x240 very impressive for a PI. Since the installation of NCSDK v2.05.00.02 is now finished, i will modify the Github program. It corresponds to NCSDK Ver2. I do not know whether the measurement method is correct, the performance is still 6.5 FPS. It is an article written by me, but combined the following procedure. Large screen support (over 1024x768) and multistick/multithread correspondence will be done next time. The following sample program is compatible with NCSDK v 2.00.05.02 + MobileNetSSD(Caffe) + Asynchronous execution. It was about 12 FPS with one stick. Due to the influence of "Global Interpreter Lock", it does not seem to be able to raise the performance any further unless it corresponds to multiprocess. Sample of Multistick + Multithread. Hello. And I'm sorry many times. 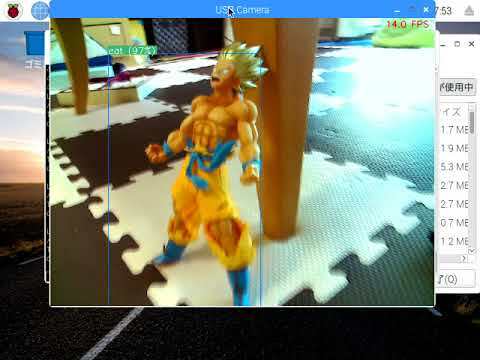 It is a rough measurement result, but it is a play speed of about 25 FPS and a prediction rate of about 12 FPS. It is out of frame because it is asynchronous. I was referring to @sggriset article. @PINTO Thanks for sharing your efforts and contributions to the Intel Movidius NCS community! Can't wait to test this one out. Supported for USB Camera Mode. In Japan, we call it "4 bai KAI-O-KEN". 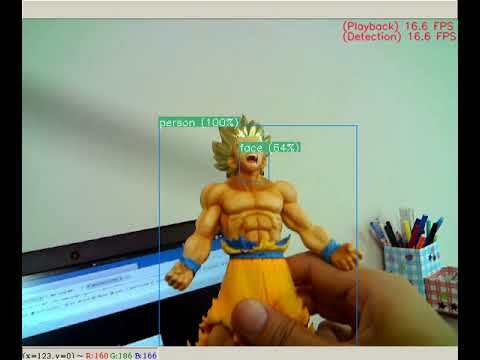 I tried combining Object Detection with MobileNetSSD and Transparent Background. By using SSD, I succeeded transparent the background while responding to dynamically changing distances. It may be interesting to look at combination with face detection etc. If you have a lot of money, that is the correct answer. Performance of UP Board 2 is incomplete, so I would like you to try it on LattePanda Alpha+OpenVINO if you can. I am poor so I can not try it. I thought that many engineers wanted to know the marginal performance. Seriously, I measured the performance for each number of sticks. Video playback rate and detection rate are calculated separately. In 4 core RaspberryPi 3 use of 3 stick or more seems to have no effect. Do you use a powered hub or plug in the sticks direct? If direct, how do you get them to fit. I am sorry I can not meet your expectations. I used a self-powered USB HUB. With RaspberryPi alone, the voltage is not enough from the second stick. "I am sorry I can not meet your expectations"
Pinto, just asking a question because the sticks are so fat with the heat sink I can not plug more than one into the Pi. I used a short USB to UBS cable and have had 2 plugged in but I think it blew up the Pi. It no longer starts giving me low voltage warnings. I am trying to rebuild a new one. I love your tests because you are trying some interesting combinations. I thought you were expecting a great suggestion on how to not use self-powered USBHub in MultiStick configuration. just asking a question because the sticks are so fat with the heat sink I can not plug more than one into the Pi. Certainly, Stick is enormously fat. As you say, connecting two directly to a USB port will inevitably make it impossible to connect other USB devices. I love your tests because you are trying some interesting combinations. I corresponded to MultiGraph and FaceDetection. 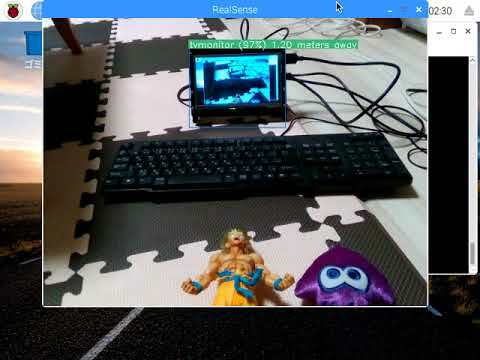 And, After changing the Good quality USB Camera and lowering the resolution, it turned out that the performance got better even with 4 Stick. When I increased the stick to 5, I got about 30 FPS. Up to the upper limit of the bus speed of USB 2.0, performance may be improved still more. Because children are asleep, I verified in the dark, and I made many mistakes in label judgment. I have learned that there is a problem that the movement of the stick becomes unstable due to heat. And I noticed that many engineers suffered from that problem. To prevent thermal runaway, simple clustering function of stick was implemented. However, Error handling is not implemented seriously. When a certain cycle or constant temperature is reached, the active cluster switches seamlessly automatically. You must turn on the clustering enable flag. The default switch period is 10 seconds, the default temperature threshold is 65°C. The number, cycle, and temperature of sticks constituting one cluster can be specified by the start parameter. However, fine-grained control is not performed automatically. Depending on your environment, please tune to the optimum parameters yourself. Hi, very nice work! Can you use the RealSense 435 module as source of depth information AND as RGB Camera at the same time? nice, but this is SDK code, so it does not report itself as a normal USB webcam I suppose? Sorry, I seem to have misunderstood the meaning of your question. Which of the following does your question mean? 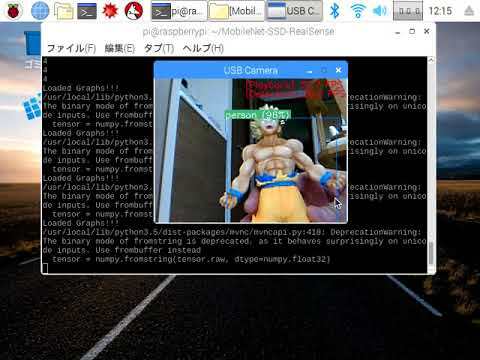 D435 + RealSenseSDK(Depth) + USB Camera(RGB) ... 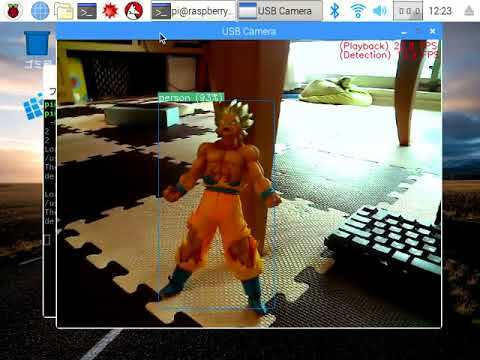 While acquiring Depth at D435, use the USB camera at the same time. 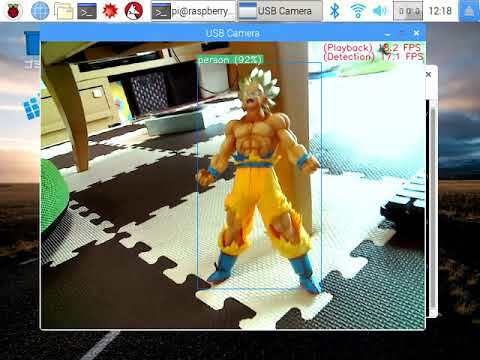 D435(Depth) + USB Camera(RGB) ... 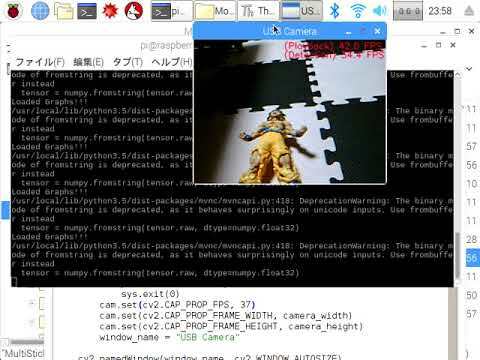 While acquiring Depth at D435, use the USB camera at the same time. 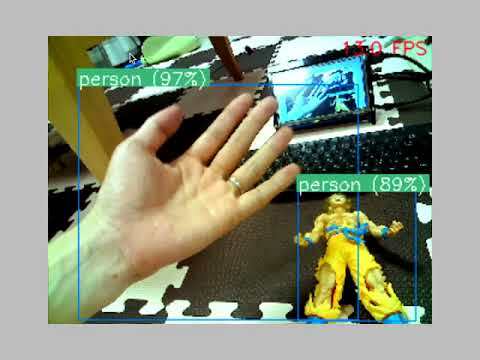 However, do not use RealSense SDK. 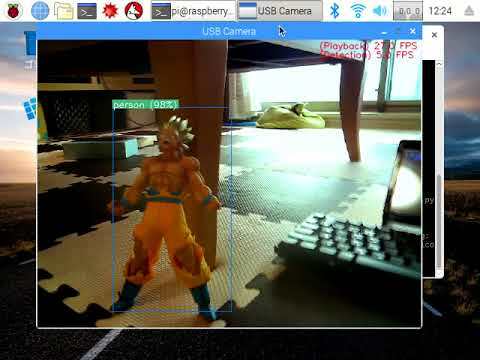 USB Camera (Depth + RGB) ... Get Depth and RGB with USB camera alone. 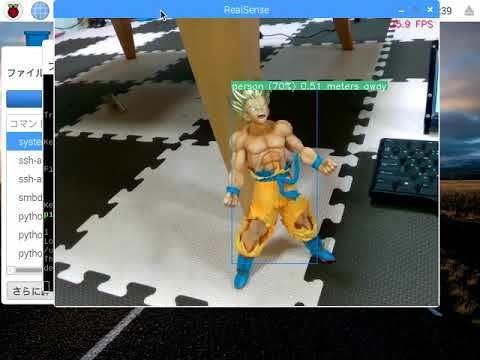 Do not use RealSense SDK at all. If it is 1... It can be realized by modifying the program. If it is 2... As long as you do not use SDK, RealSense will not work. If it is 3... （1） If you know the height of the object, you can measure the coarse distance from the illuminance information with only one USB camera. If it is 3... （2） If you have two USB cameras, you can calculate the distance with a simple trigonometric function. Please read the article using Google Translate. What I meant was 1.) I want to measure distance and use the RGB camer at the same time from the D435 so that I only need one imaging sensor and thanks, I will look at your code, I have just ordered the devices.